13 year old Zim a his companion Gir was sent to earth by Tallest Purple to see if all types of life would be able to live on planet Earth (Purple wanted this because he saw planet earth as a beautiful planet), and also take note that Tallest Purple and Tallest Red's beliefs are very different Purple prefers peace and Red prefers war (This will lead to problems between the two tallest in the future too). Here's some extra info about Purple and Red - Red prefers spicy foods while Purple prefers sweet foods, and The tallest are 19 feet tall (The other irkens are around the same height as the average human). On the topic of the Tallest Tallest Miyuki and Tallest Spork are in this headcanon too. Info about them can be found on their ref sheet which I will link below (in the ref section of this post). Lastly Tallest Purple raised Zim behind Red's back. So once Zim and Gir reach planet Earth the same as in the show happens when he sets up his house and disguise, and after that has been settled the next day happens and he goes to the skool (The word Skool is how School was spelled in the show) and meets the class but instead of being hounded down by Dib (as seen in the show) Dib is more of a alien/paranormal coffee-loving fanboy that wants to befriend Zim but with the help of Gaz they do become friends. Speaking of Gaz she's more understanding in this headcanon than she was in the show. Her patience is a bit higher in here, but she still loves playing games as much as she did in the show. 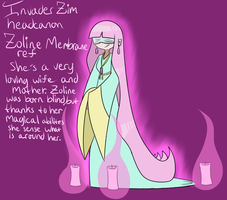 Another thing about Gaz is that she practices grey magic which is a mixture between light and dark magic (Her mother Zoline has a similar ability except Zoline's magic is pure light and not grey). She even has a huge spell book too. Another thing about Gaz is that she's dating Matthew before then she wasn't as patient as she is now. Professor Membrane's personalty is pretty much the same as in the show, and he hates coffee and has banned it from his house because it’s the drink that ended up causing him to lose most of his body. In short the horrible drink was dropped by one of his ex employees and it landed on a fuse causing a large explosion blowing him up and the employee in the process. His other employees that survived repaired him. Keef and his friends act different than in the show. Keef is severely obsessed with Zim, and Keef despises Dib not only because of Dib being close to Zim but also because of both of their families being rivals. Both families are rich Membrane's family focuses on providing power and other inventions to the world, while Keef's family runs the Poop company (Poop-Cola ect). Gretchen acts very different from the show instead of sweet she's mean and is a bully towards Zim (she bullies Zim because she still has a crush on Dib [Keef does not know about the bullying "yet"]). Not only is Gretchen friends with Keef and the others, but she's also friends with Jessica and Sara (they're the popular girls of the skool). Gretchen and Jessica bully Zim, but Sara refuses to do it as she is the only one of the three with morals and with that fact she tries to get them to stop bullying him. Melvin is crazier than he is in the show (he's the only one of Keef's friends that addresses Keef as boss). Dirge is the handy man/boy of the group and he somewhat acts the same like in the show. Matthew on the other hand acts very different from the show. Instead of being scared of a lot of things he's not afraid of things and he will stand his ground if needed. He's a rock music-loving half vampire with a laid back attitude (until someone pushes him too far and makes him mad). As said above Matthew is dating Gaz. He even taught Gaz how to play the electric guitar. just because he doesn't know how to start a conversation its different with vampires he will start conversations and try to make friends with them quickly. If one should ask him about his shirt or say his hair is cool he will open up quickly and start to talk. He has a hard time talking to girls he likes when a pretty girl speaks to him he freezes up and stares at her which in turn freaks her out and she will walk away or call him weird then walk away. Only one girl continued trying to talk to him and he finally snapped out of his awkward stare and start to talk to her in return she moved away soon after that but they still write to each other. Gaz and Matthew's ref Matthew's parents ref (and Matthew's sisters) (Info about his parents are in the description of the picture) Younger Keef's ref Meef's ref I've decided that in this headcanon Keef is part demon (his mother's side is demonic [Their demonic species is called the Spiked Oni], but the demonic traits skipped both Keef and his mother [Keef's little brother Meef does have the demonic traits but they're slight due to their father being human]) (baby Keef and his grandmother from his mother's side of the family) .Keef's parents and their maid Gaz's/Dib's mother and father Nu-Clear works with Professor membrane and her personality eccentric but she's a loving mother of her son Geno (who is quite unstable). Maid of the Membrane family and the Skool lunch lady ref Kurayami Taint is the maid for the Membrane family (Kurayami Taint isn't human, but none of the members of the Membrane family know except for Gaz and her mother Zoline since both of them can sense that she's not human). The lunch lady has some creepy vibes about her like she's waaaaaay tooooo happy for a normal person (My intention when creating her was for the children of the Skool to make creepy rumors about her as to why she is the way she is [like maybe she's a alien, or even some sort of soul stealing demon]). Iggins and his parents ref Iggins is still a rival of Gaz. ability to read minds and see dreams. He has also became a painter often painting the dreams and thoughts of his friends. has gotten enough to eat he is back to his happy friendly self. Akume and her band called Unmei is a popular musical group of androids. Prisoner 777 (aka Sev in this headcanon) is a Vortian that was experimented on by Red because he was curious to see what the demonic black matter serum would work on a Vortian. Sev is very close friends with Zim (they've known eachother since they were babies). Sev doesn't have kids due to him being afraid of having them (he doesn't want his corruption to spread to them). Tak and Skoodge are a couple that works for Tallest Purple to get info on Red as to why he's acting evil (In this headcanon Purple doesn't take kindly to violence). Mimi was assigned to both Skoodge and Tak. Maddie's personality is sweet and playful. She rarely gets fussy when she does though her eyes glow red (like how her father's eyes glow red when he's mad). Beginning of arc 3 - Protagonist #2 lives! Corrupted higher up is "defeated"
Corrupted particles (from the corrupted higher up fight) have since been forming into a very powerful being! Protagonist #2 faces up against this mass of corruption only he can save the earth from total DOOM!!! I never thought it was possible but I think I'm afraid of keef now. This is an interesting take on everything. I really love your designs of everyone too. They look really rad. Welcome I do want to make this clear that since you said in our other conversion that you want to draw her. I must say right now that I want Zoline to be drawn appropriately (meaning nothing that's considered distasteful [I saw in your gallery some stuff was not kid friendly]) which is why I said what I just said. I hope you understand what I am trying to say. i would do that to any character under 18. some of it like this i do have bonderies. What a nice little headcanon you have here! Thanks. The comic will be continued a long side the Cuphead one.~ Also the headcanon is as long or longer than the Cuphead one. The IZ one has 4 arcs while the Cuphead one has 3 endings to it. How are you makeing this info sheets? I mean this big picture with infos right here. Isn't this a picture? I mean the "Small update- InvaderZim headcanon info so far". NOW I understand it. I found the "Journal"-Button. Ty for help. this update really helps clear up some things and i love that purple raised zim! it's such a cute little detail to add! With that said my InvaderZim headcanon can be found here. could you please tell me the name of your second arc or give me a link to the 1st page? Artem is a varied artist from Russia. He has a spectacular surreal style that will certainly blow your mind! If you take a look at any one of his oil paintings you would absolutely believe at first glance that you were looking at a sculpture, but no. His works are actually oils on canvas, but his keen sense of dimension, light and shading will certainly have you thinking twice! Demosthenes is a traditional artist from Greece. He is very skilled at using micron pens and his highly detailed illustrations are certainly something to marvel at. He has a passion for architecture and landscapes and manages to create wonderful movement through the use of line variations. The textures he creates are fantastic and really add life to his illustrations. Nicholas is a traditional artist from the US. His works are vivid and full of detail and stir up a wide range of emotions within the viewer. Though some may find his subject matter uncomfortable, Nicholas says "the works personify deep meaning through the use of wit and satire. Inspired by nature, politics, ethics, and man’s endless ability to be destructive, the works make us question our beliefs and the idea of reality." 1 200 Points! - Art Contest - Monthly - LiveHello artists, push your skills even further. Participate in my new monthly contest and win awesome prizes! 1 200 points give-away art contest + free photo references. Theme of the contest is "Sign of Blue"
Lee is a digital artist from the US. He is a conceptual artist and illustrator who has been working primarily in the video game industry for the last 17 years. His strength is his 3-D work which is extremely well executed and expertly colored. His imagery is eerie and surreal and you are sure to be inspired by his gallery! 50 facts meme and artbook featureLet's start that DA's helpdesk is actually... not so helpful at all. our previous art contest knows the winners so here is your another chance to win awesome prizes! Theme of the contest is "The Creature"
2) Artwork could be colorful or even black & white but must include the element of creature - What does it means? Well you have to (for example) redraw my reference into unhuman beign like - mutant, godzilla, human with evil head etc. it's up to your fantasy. 3) Could be realistic or abstract, in sad or happy mood - it's up to you.